As a "thank you for letting me crash in your guestroom until my new lease starts," my good friend Rosie took my roommate and I out for dinner in Arlington. We went to Eventide in Clarendon, a spot that is near and dear to TWSF's hearts. We've only been for drinks and herbed french fries, so I was excited for a chance to try the dinner menu I've heard so much about. Eventide's Executive Chef, Miles Vaden, came over from Sonoma Restaurant and Wine Bar in Washington D.C after serving for 2 years as a chef de cuisine. Not only does he offer appealing dinner options, he also serves up a pretty classy bar menu. Eventide spans over 3 floors: 1st floor bar/lounge, 2nd floor dining room, and 3rd floor roof deck bar. It's a little fancier than some other Arlington restaurants, but it is definitely on par with the local yuppie scene. 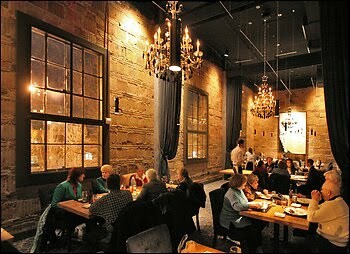 The dining room is elegant and romantic with it's chandeliers and high ceilings. The velvet booths were among the most interesting booths I've ever had the pleasure of sitting in - the end of the booth actually closes on you, almost as if you are on a ride in Disney World. I would categorize this place as a great first date spot. We started off the evening with a bottle of red wine and yummy bread dipped in oil. The chef kindly sent a tasting of something, but to be honest I can't remember what it was now (I do remember it being good and FREE). 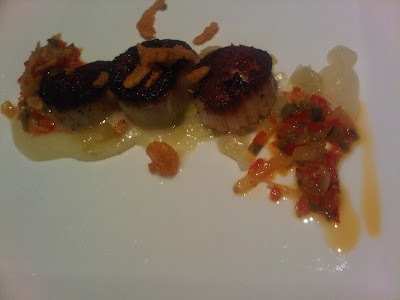 We ordered the Seared Diver Scallops, served with potato puree, melted leeks, and three pepper escabeche for a light appetizer. I'm a huge scallops fan (although not as obsessed as Jaime from Top Chef, or should I say "Top Scallops! "), and these did not disappoint. 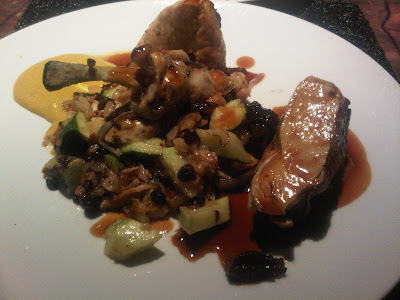 For my entree, I chose the Bell and Evans Chicken Breast served with buttermilk biscuit pan stuffing, summer squash, pinenuts, currants, yellow pepper Romesco, and morel chicken jus. I actually never order chicken at restaurants because I hate to pay for what I can easily cook at home. However, being a typically foodie, this seemed to be the obvious dinner choice after reading raving reviews on Yelp. Boy was I right. That chicken was absurdly delicious. It was moist, and worked perfectly with everything around it. 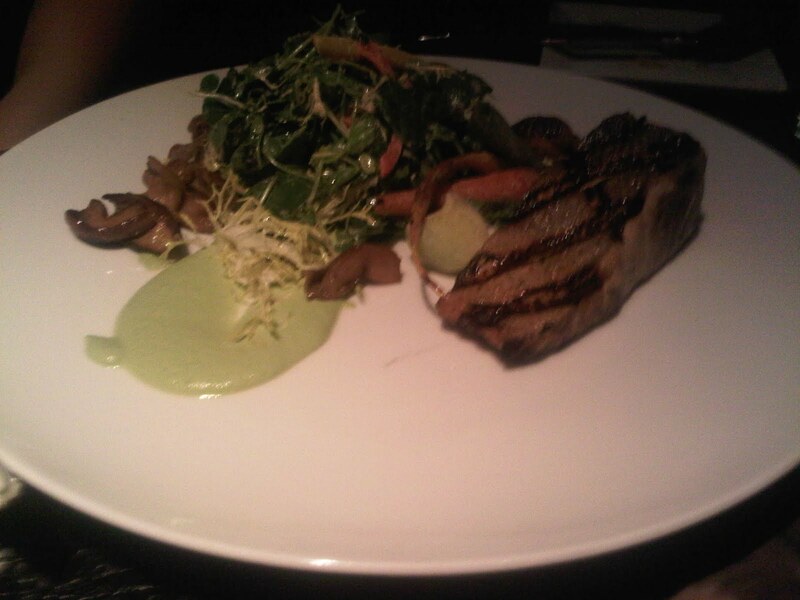 If I were to go back there for dinner, I would definitely order this again. Rosie and Nicole got the Grilled Wild White Salmon served with pea shoots, dandelion greens, grilled baby carrots, truffle/porcini vinaigrette, and soybean puree. Instead of your typical pink salmon, this one had white flesh. After doing a little research on Wikipedia, it appears that the color of salmon flesh is directly related to the food it eats. In the wild, salmon eat small shellfish and krill that add to their carotenoids pigments such as astaxanthin and canthaxanthin. These pigments are added to the feed of farm-raised salmon as artificial colorants, since most consumers prefer pink salmon flesh. Astaxanthin which adds a pink hue, actually increases the antioxidant levels in salmon, increasing the health of the fish and as a byproduct, your health. Unforunately, canthaxanthin which gives adds an orange hue, is believed to cause damage to the human eye if high levels are consumed. While this is all very interesting, my question is, how do you get a white "wild" salmon? I almost wonder if that menu title is a mistake, though I won't worry too much since it was a good meal regardless (we all tried each others meals because that's what friends do!). I must speak to the service because this is a restaurant review after all. For the most part, the service was good. It was a little confusing as to who our server was (I think 3-4 different people took our orders and delivered our food), but other than that there were no issues. This is a great restaurant whether you are going for a romantic dinner, or happy hour. Word to the wise, if you are going on a weekend night for dinner, make reservations at least a day in advance. If you are headed to the lounge or roof deck, you might want to get there early.